It seems like every time you leave the grocery store these days you find yourself looking in your shopping bags on the way home thinking, “I certainly didn’t get much for that £100 did I?” Yes your precious dollars, euros, and pounds have to keep reaching further and further to buy what they used to in all facets of daily life. Thankfully though when you return to your humble abode, put away those groceries, and enter your hi-fi listening room you might just find that the inflationary trends you are seeing outside your listening room doors have been stopped cold in their tracks and have been sent packing. As your long-time economist chum Adam Smith and his invisible hand would attest, the free market competition in entry level analogue has soared in recent years. If there is any clear market direction lately regarding the entry level it is that you are now getting more performance and quality for your hard-earned dollars when it comes turntables. Now Adam if you don’t mind, feet off the coffee table please! 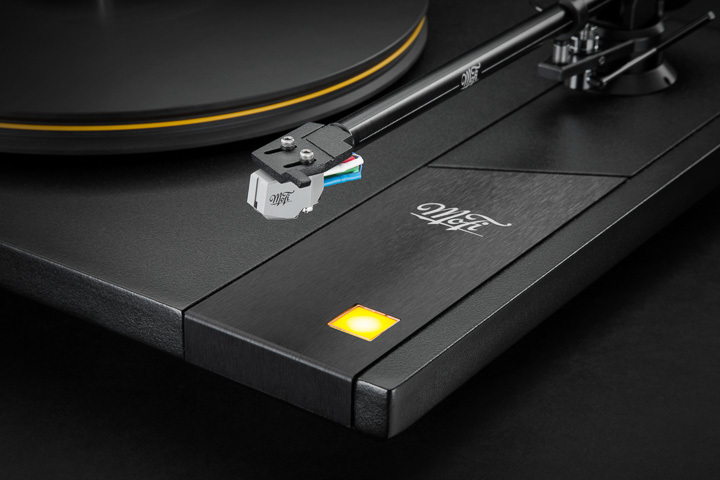 Mobile Fidelity is the latest outfit to join this value themed analogue soirée with their newest offering; the Studiodeck with Studiotracker cartridge combination (£1,200 or $1,200 for the pair). “Mobile Fidelity?” you might be saying, “aren’t those the guys in the lab coats that make those nice audiophile grade half-speed mastered records?” Well yes, Mobile Fidelity is in fact the company that has made its sterling reputation on carefully recreating some of our most beloved vinyl and SACD classic titles. Holding a Mo-Fi vinyl reissue is the audiophile equivalent of a sigh of relief, knowing that the product they hold in their hand makes a point to exceed and surpass the typical corner-cutting LP reissue bonanza. Mobile Fidelity is coming from years (five decades if you’re counting) of hard won credibility as they have made the decision to enter the front-end game and they are happy to be able to bring a little something extra to the party, a nice dose of star-power. Mobile Fidelity adroitly enlisted Allen Perkins of Spiral Groove fame, who is said to have designed and overseen all aspects of production with Mobile Fidelity Studiodeck. For those readers who might truly be new entry level buyers researching tables for the first time, this collaboration with Mr. Perkins should be interpreted as a big deal. Spiral Groove’s well reviewed and fabulous looking turntables routinely soar into the tens of thousands and legitimately have staked out their own corner of the ultra high-end echelon. One can see why Mobile Fidelity felt they had landed big fish, so to speak, when they empowered Mr. Perkins to see what can be accomplished using his wits at the £1,000 price point.